This is a mid century modern arm lounge chair with a solid wood frame with slatted back and sculpted arms, and newly upholstered seat and back cushions in a lush elephant gray velvet. Dimensions: 23″ seat width, 20″ seat depth, 17.5″ seat height, 28.5″ back height. This is a mid century modern arm chair with a solid wood frame with slatted back, and newly upholstered seat and back cushions in a lush elephant gray velvet. Dimensions: 21.5″ seat width, 19″ seat depth, 17″ seat height, 28″ back height. This is a mid century modern arm chair with a solid wood frame with slatted back, and newly upholstered seat and back cushions in a charcoal gray tweed. Dimensions: 21″ seat width, 19.5″ seat depth, 17″ seat height, 27″ back height. This is a mid century modern arm chair with a solid wood frame with slatted back, and newly upholstered seat and back cushions in a soft black naugahyde. Dimensions: 20″ seat width, 17″ seat depth, 16″ seat height, 30″ back height. This is a mid century modern arm chair with a solid wood frame with slatted back, and newly upholstered seat and back cushions in a lush elephant gray velvet. Dimensions: 23″ seat width, 19″ seat depth, 16″ seat height, 30″ back height. This is a mid century modern ottoman with a solid wood base with splayed legs and an upholstered tufted cushion in turquoise naugahyde. Dimensions: 18″W x 18″D x 16″H. 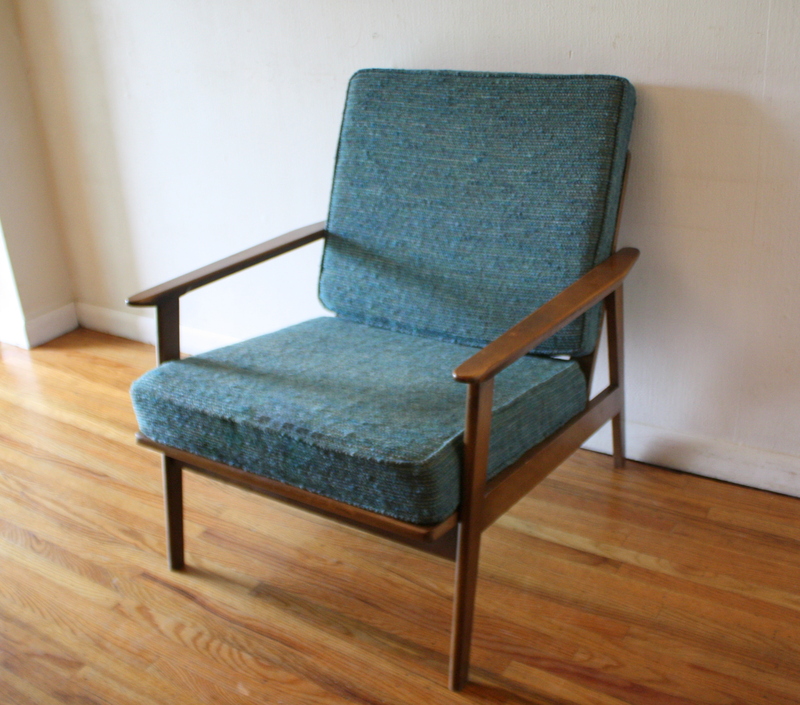 This is a mid century modern arm lounge chair with turquoise tweed cushions. It has a solid wood frame with a beautiful slatted back and curved arms. Dimensions: seat width: 19″, seat depth: 18″, seat height: 18″, back height: 31.5″.